Our food is made up of: Carbohydrates; Protein and Fats. Our body needs to digest them – turn them into a form that can be absorbed into the blood and used by cells. Enzymes make this possible. Enzymes are proteins that facilitate specific chemical reactions. Digestive enzymes facilitate the chemical breakdown of food into smaller, absorbable components. 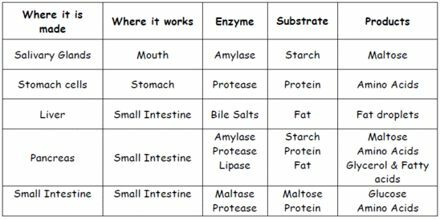 Enzymes called amylases break down starches into sugar molecules; proteases break down proteins into amino acids; and lipases break down fat into its component parts.